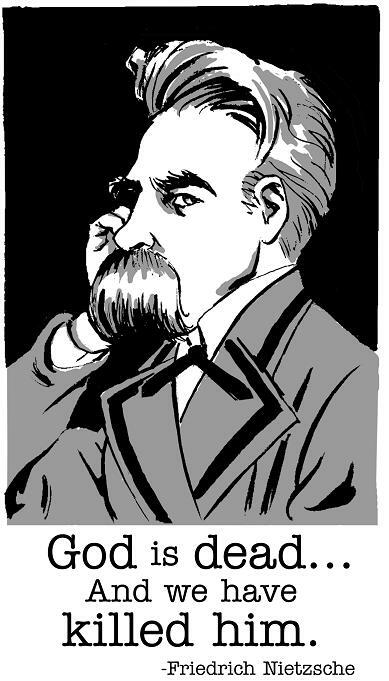 "God is dead," these are the well known words of German Philosopher Friedrich Nietzsche. Some today believe this to be true. With the advances in technology and science, man does seem to have become god and therefore has no use for this entity. Moreover, Atheism seems to be gaining ground in regions of the world that at one point promoted Christianity. God seems to be a thing of the past - an archaic explanation for the processes of nature and its existence. 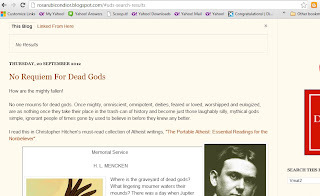 Rosa Rubicondior on her blog "No Requiem For Dead Gods" cites the late Agnostic, Christopher Hitchens' book, The Portable Atheist: Essential Readings for the Nonbeliever. In his book, Hitchens presents his usual hyperbolic rhetoric. He resorts to Appeal to Authority, False cause and Appeal to Ignorance. This is nothing knew. Those who claim to be Atheists (who are really Agnostics) always resort to fallacious argumentation to support their ideas. In reality, Atheism is a premise that can never be proven. It must be taken on Faith, so to speak. There exists no Atheist who can show that there is no God. One must take his/her arguments and make a conclusion based on them. In the end, they are just arguments, not empirical evidence that are falsifiable. In the citation Rosa provided, Hitchens presents a writing from H.L. Menchen who was an American satirist and journalist. The writing, "Memorial Service," goes on in detail describing and listing the gods of ancient peoples who are now "dead," so to speak. These gods were once "all powerful, and great" to these people and today are nothing more than dead myths. They were worshiped and feared. Sacrifices were offered to appease them. "They were gods of the highest standing and dignity—gods of civilized peoples—worshipped and believed in by millions. All were theoretically omnipotent, omniscient, and immortal. And all are dead." 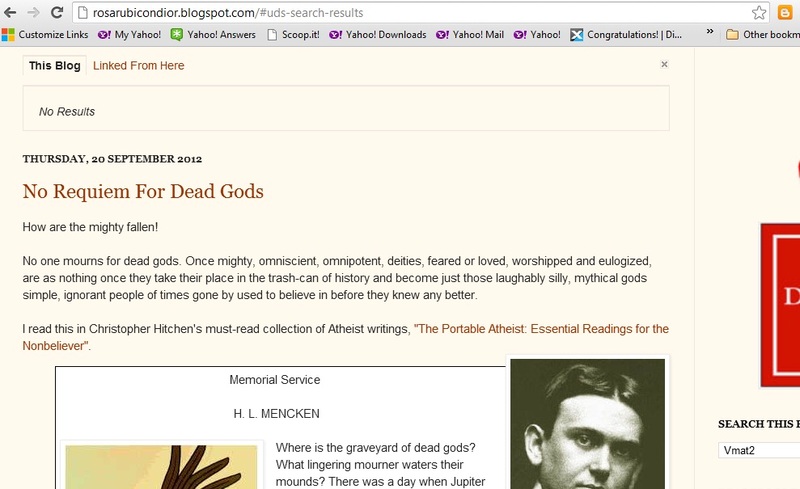 The implication made here by Menchen, Hitchens and promoted by Rubicondior is that gods eventually die. They do not die in the sense human beings die, but die in concept and practicality. To a certain extent, the aforementioned are correct in this assessment. The 'god's' of ancient peoples are dead and no one worships them. "Just as with those old, quaint gods of recent history, today's gods will one day join that long, un-illustrious pantheon of old dead, once immortal and indestructible, now powerless gods that no one mourns, to whom no one sings songs of praise, in whom no one now has any faith, whose grave no one can find and on which no one would bother to put any flowers." Will the "gods" of today "join that long, un-illustrious pantheon of old dead?" Well first Rubicondior must expand on what "today's gods" actually means. In today's world, monotheism pretty much is the dominant religious force. That being said, there are no 'gods,' just a God. The world's largest religions, Christianity and Islam both believe in One God. It is safe to say that this One God is the same since Islam borrowed heavily from both Judaism and Christianity. Similarly, Christianity is the child of Judaism. The question remains, will this God or the gods of other polytheistic religions die off? While I do not presume to speak for Islam, Judaism or the latter, I will speak on behalf of Christianity - particularly Catholicism. God or gods will never "die off." Hitchens and Rubicondior are obviously aloof to the science regarding the VMAT2 gene. Hitchens was alive when the discovery of this gene was made public, yet to my knowledge he never addressed it. Moreover, Rubicondior on her blog claims to be a "biologist," so she should be aware of this study, yet she seems ignorant of it. A search on her blog will produce no results as shown here on Sept. 22, 2012 at 4:50 PM Eastern Time. Menchen who died in 1956 was obviously unaware of this science and therefore I cannot label him as ignorant. Had he lived today, his writing would have had to be updated to reflect the knowledge we possess regarding the VMAT2. The VMAT2 gene predisposes all human beings to belief in God and the supernatural. Contrary to the idea "we are born atheists," this gene empirically shows that we are all indirect theists at conception, if you will. In light of this, God or gods can never be dead. "God" is hardwired into our genome. 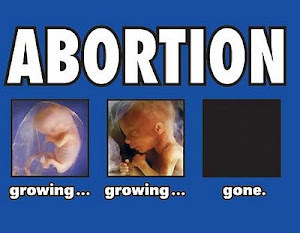 To "kill God" is to kill us, or what makes us genetically human. Is this the "Image of God" Genesis mentions? Moreover, the comparison of the gods of ancient peoples cannot be applied to the One God. These gods were attempts by man to put into language and practice what the VMAT2 instructions give to the human being. 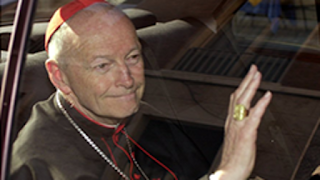 The Catholic Church does not devalue these attempts to define God. The One God revealed Himself to man, first to the Hebrews and now to the rest of the world through Jesus Christ. The difference between this God and the other gods is that this God is actually alive. This God actually works in the world. Those who believe do so not because of fancy theological arguments or dogmas but because they experience one way or another this God. Whether Atheists like it or not, we are all wired to believe in God and to seek the supernatural. Perhaps this is why Atheists are so fixated on Theism. Anyone who does not care to entertain religious beliefs will not dedicate so much time and thought on them. Rubicondior labels herself a 'humanist,' yet why is her blog solely focused on God and religion? Where are the blogs promoting clothing and food drives? Where are the blogs promoting blood drives and bone marrow donations? Where are the blogs promoting efforts that help humanity with its basic needs? Vmat2 is obviously instructing Rubicondior to ask questions - to seek God and the supernatural - otherwise she would not take so much time blogging on the topic. God is not dead. God is alive and working in everyone, even Rubicondior. God died already and came back, this is why Christianity is the largest and most influential religion ever to exist. We killed God 2,000 years ago and He came back. Even today, Philosophies have tried to kill God, but He comes back. Atheists try to kill God, but He comes back. Belief in God never goes away. It is hardwired in us. God will not die. What will die are speculative Philosophies based on hyperbolic rhetoric. Atheism, which already has the lowest retention rate will be mourned by God and those of Faith. "Those who claim to be Atheists (who are really Agnostics) always resort to fallacious argumentation to support their ideas." I'll just leave you to your ignorance then. Well you are proving my point now with your comment. I enjoy reading your posts for practice, but one is getting old. VMAT2 gene that you repeatedly reference is not working into supporting your arguments as it appears to be expected. The simple fact that humans adhere to supernatural explanations does not provide suffice for them. In our early ages, it was the fact that we relied on quick answere and instinct that this played a role. When we later evolved more into socieities this formulated the ideas of deities. Humans rarely fully logically deduce many things, so yes, it is a struggle between our blind assumptions and actual reasoning and understanding. All it shows is that it takes more logic and work to be an atheist than a theist. Your comment exactly entails the "God myth challenge" I proposed last month. You are assuming that "societies.. formulated the ideas of deities." This is implying that God is made up. The problem here is, if God was made up by man, then why did nature instill this gene that predisposes us to search for God? Remember, nature evolves using what it is aware of. In other words, an organism can develop immunity because it was exposed to a danger first and adapted. Nature as we know only operates in the physical realm, so why this VMAT2? In order for this gene's existence to make sense then human beings must have had prior exposure to the supernatural in order to develop a gene that allows a human to be aware of it just like organisms develop immunity after exposure to an imminent danger. Even today, after all the evolving and advances in science we still contemplate God. Oh, and don't ridicule people for their censorship of comments when you yourself censor yours. I do not censor comments. I try to provide an academic environment well all can read posts and comments without having to see vulgarity and the like. 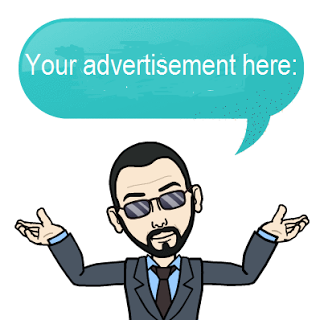 If your comment is related to the post and meets the criteria, then it will be posted. However, if the post is about traveling to Disney or using F's, B's and other four letter words, then it will go to file 13.